With the 4th of July happening this weekend, I thought I would teach My Flag, My Flag. I've always wanted to do a 4th of July themed singing time but I never had enough time to teach both a 4th of July AND Pioneer Day themed singing time. But this year things panned out well with a simple monthly song that I will only spend 1 week reviewing (I Love to See the Temple) and 5 Sundays in July! So I thumbed through The Children's Songbook and thought My Flag, My Flag looked simple enough. My Country would also work well...in fact, any patriotic song will work well too! I'm heading out tonight to find mini flags (hopefully from Target in their dollar section, 3 for $1.00 I've heard) but I'm going to guess that you can get them at any dollar store. I'll keep you posted when I find some! You'll need at least 12 and if you use my Junior activity, you'll need one for each child. You could also make your own or scarves would work well too. Before primary, write out the words to the song on the chalkboard. For an attention getter, we'll simply sing the song through and quickly discuss the meaning of the song, why we have flags, what they represent, etc. For a total of 10 points (from 2 judges) which equals 10 steps. So, the first team sings the song and is judged on a scale of 0 - 10. A child goes to the back of the room and steps the same number of steps as their team's score (their heel must touch their toes when they step). Where they end, put down a marker (I'll be using a piece of masking tape) so the next time it's that team's turn, they will know where they left off. Then the next team goes and repeats. Each team will take turns until a team's toe touches the bucket of flags. Once touched, that team takes a flag back to their team. The team with the most flags at the end wins. To make the challenge gradually harder, erase various words from the chalkboard between turns. Raise the flags when we sing the word "flag," "wave," rhyming words, etc. This Junior primary activity would also work well with Senior primary too! The Senior primary could also sing several of the patriotic hymns found in the Hymn book. Sorry I read this too late. 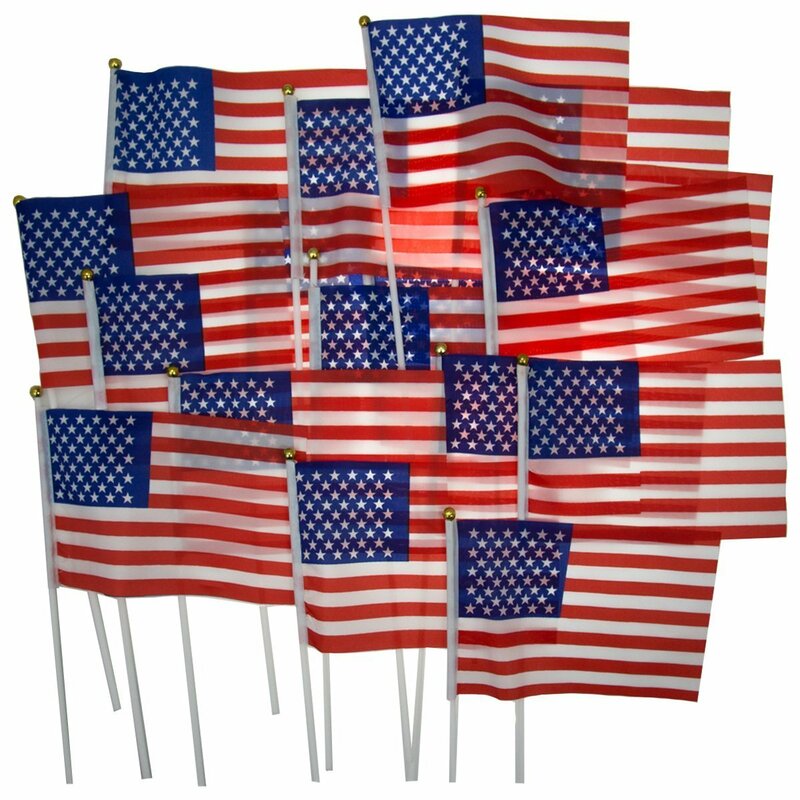 I found 12 flags for under $2.00 at Zurchers. We also used Kazoos to make a "instant primary band." We have a local community parade of the 4th so we used singing time to prep for the parade tomorrow. GREAT FUN!